Germany, between 1450 and 1475. Original blind-tooled quarter pigskin over wooden boards. 139 leaves (1 column, varying number of lines), bound : paper, ill. ; 207 x 145 mm. Purchased by Curt F. Bühler in Feb. 1959 from William H. Schab, New York (Cat. 25, no. 152). 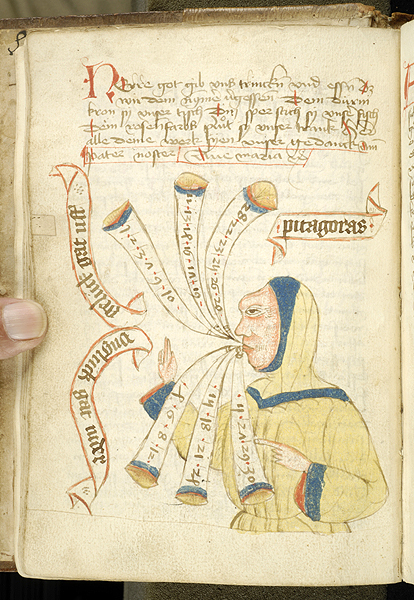 Ms. medical and astronomical handbook; written and decorated in Germany in the third quarter of the 15th century. Some of the tracts in the volume appear to be entirely unknown--Cf. PML files. On fol. 31r is a depiction of Pythagoras as a mathematician. Decoration: 2 colored drawings, 2 uncolored drawings, 14 diagrams.